This upcoming wearable by Acer has a 1.6-inch display, coming with a design compliant with the IPX7 water resistance standard and being powered by the MediaTek MT2523 processor. In addition to the various notebooks and convertibles everyone expected to see, Acer also unveiled a new smart wearable during this week's press event in New York City. Dubbed Leap Ware, this fitness-themed smartwatch is expected to hit the market in July. Acer Leap Ware comes about two years after the Liquid Leap+ fitness band but aims the smartwatch market. Its stainless steel round frame makes it look like the Pebble Time Round. Its specs and features include a MediaTek MT2523 processor, multiple sensors, a 1.6-inch display with Corning Gorilla Glass SR+ for protection, also being rated IPX7 for protection from water. This wearable has a battery that can last up to five days on a single charge and can pair up with both Android or iOS handsets via the Acer Liquid Life app. This piece of code can store all the fitness data collected by the smartwatch, but can also be used to set fitness goals. Acer Leap Ware will come with Navy Blue and Light Brown bands, being expected to retail for $139 USD. NEW YORK - Acer announced its Leap Ware smart fitness watch today at its [email protected] global press conference in New York. 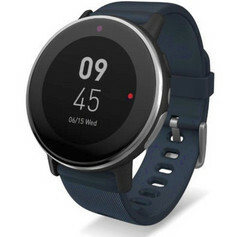 This sleek smartwatch expands the company’s range of smart devices that integrates seamlessly into daily lives, allowing users to manage personal fitness goals and stay connected to friends and family. Acer’s Leap Ware smart fitness watch features a polished stainless steel circular frame with a simple and minimalistic design. It is suited for daily usage and allows the user to benefit from a rich suite of wellness and fitness features. Equipped with the MediaTek MT2523 chipset and MT2511 bio-sensing chip, the Leap Ware smartwatch has diverse fitness tracking features thanks to an array of sensors with advanced algorithms. It can monitor heart rate, stamina, stress/fatigue levels, and exposure to ultraviolet rays. It also boasts three to five days of battery life2, which means users won’t miss out on logging important stats, such as during extended trips or when they simply forget to charge it overnight. Designed with durability in mind, Leap Ware’s 42-mm (1.6-inch) face features with Corning® Gorilla® Glass SR+ which delivers superior scratch resistance with the legendary toughness, optical clarity and touch sensitivity of Gorilla Glass. The Acer Leap Ware has an IPX73 water resistance rating and can survive an unexpected torrential downpour. Also included is a built-in LED light which illuminates at the press of a button. This opens up many conveniences like unlocking your front door late at night or acts as a safety feature while jogging after the sun goes down. The Leap Ware’s bands are interchangeable and come in Navy Blue or Light Brown. But being compatible with any 20-mm (0.7-inch) watch band the user can further customize the device to add even more personal flair. Acer’s Leap Ware smartwatch can be paired with an Android or iOS smartphone4 via the Liquid Life™ app. Users can see who is calling or texting, and use the phone’s large touchscreen as a dashboard for analyzing all of the data collected by the Leap Ware’s advanced sensors. The Liquid Life™ app lets users set daily fitness goals with notifications to coach them, so they can stay motivated and on track. In addition, all exercise sessions are recorded in the app and a friendly avatar gives users a snapshot of how they’re progressing towards pre-set goals. As an added incentive, users can soon earn Power Coins through a number of activities like running for a number of consecutive days, biking for a certain distance, and more. Best of all, the smartwatch can motivate users by encouraging some friendly competition with others to see who can collect the most Power Coins. This gamification adds a unique motivational bonus, with the Power Coins being redeemable in the Liquid Life Market for various items, rewards and potential discounts. As announced earlier this year, Acer has joined forces with MediaTek and Taiwan’s Easycard company to sponsor 13,000 special edition Leap Ware smartwatches for the 2017 Universiade Taipei games to be held in August. The devices will be used exclusively by athletes and staff. They will not only help the attendees keep tabs on their stats, but also allow them to ride on public transport and pay at convenience stores during their stay through integrated Easycard functionality. The Acer Leap Ware will be available in North America in July with prices starting at $139; in EMEA in Q3 with prices starting at €139; and in Taiwan in August with prices starting at NT$4,990. To find out about availability, product specifications and prices in specific markets, please contact your nearest Acer office or retailer via www.acer.com. The Acer Leap Ware was unveiled today at the [email protected] press event held in New York, where the company announced a range of new devices and solutions for gamers, creators, families, students and professionals. For more information, visit www.acer.com/nextatacer. 1 The Leap Ware Smartwatch is not a medical device to be used for the diagnosis of any medical condition. 3 Leap Ware is IPX7 rated and can withstand incidental exposure to water of up to 1 meter for up to 30 minutes. The user can wear and use the Leap Ware device during exercise, in the rain, and while washing hands, but submerging the Leap Ware is not recommended.